Want to find online surveys easily that pay by gift cards, Paypal, or check by mail? Real Surveys That Pay partners with leading market research firms to offer surveys with fun topics that will pay you. You'll be able to view approximately how long it will take you to complete the survey and how much you'll be paid for it before you take it. 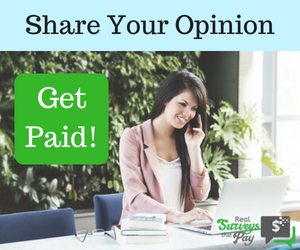 Sign up today to start earning cash or gift cards by sharing your opinions online.